The death of Abdel-Hakim Amer, a key figure in the 1952 Free Officers Coup, has been sent for investigation by the military prosecutor. Prosecutor-General Abdel-Meguid Mahmoud made the decision on Thursday after a case was filed by Amer's family members who believe he was murdered. The regime of Gamal Abdel-Nasser announced at the time of Amer's death in 1967 that he had committed suicide. Judge Adel El-Saeed, deputy prosecutor-general, said all documents related to the case had been sent to the military prosecutor. 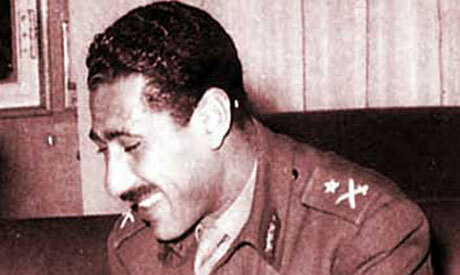 Amer commanded the Egyptian Army during the Suez Crisis, the North Yemen Civil War and the 1967 War. The death of Amer is controversial. In one version of the story it is said he committed suicide by swallowing poison after Egypt's defeat in the 1967 War. Another version says he was approached in his cell by high ranking Egyptian officers and given the choice to remain there and stand trial for treason, or die by taking poison, and he chose to take poison and die with honour. It was well known within the inner circle of the Free Officers and their families that Amer was 'suicided'. The events leading to the demise of Abdel Hakim Amer have been very explicitly covered in the autobiography of Anwar el Sadat, which I believe is one of the most authentic eye witness accounts of the tragedy. Unlike Amer, Nasser was suffering from severe ailments prior to his demise and was treated in Soviet Union but without much success. His death was no mystery as it was personally witnessed by many distinguished and reliable physicians and friends. Consequently there should be no controversy about this. The target of the investigation is to defame Nassser. Mohamed Heikal's claimed that Nasser was poisoned should also be investigated. How a 52 year healthy man suddenly died is totally unintelligible.